Although the tanker was undamaged, the £465 million frigate took on large quantities of water and was in danger of sinking when the captain took her into shallower water before running her aground. Two of them were taken to a nearby hospital. The Maltese flagged tanker, Sola TS, was undamaged and its 23-man crew unhurt. Norway's Accident Investigation Board said a towboat was also involved in the accident, but didn't say how. The shipping site Sysla reported the tanker had been loaded with crude oil and was on its way to Britain. 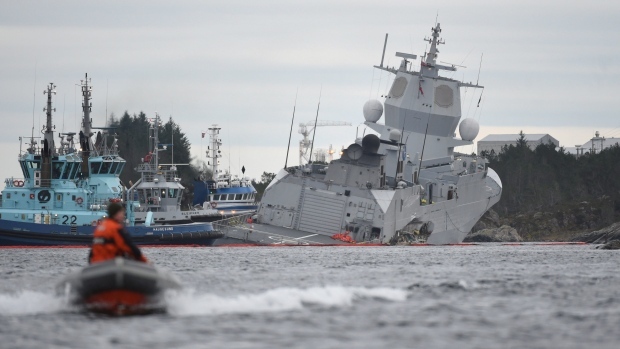 A Norwegian Navy frigate is about to sink after being hit by an oil tanker on Thursday while docked in a habour. These included the Sture export oil terminal, the Kollsnes gas plant and several offshore oilfields, all of which resumed operation later this afternoon. The frigate, which recently took part in a major North Atlantic Treaty Organisation military exercise, was aground and tilting on one side, live television pictures showed. The Marine Safety Investigation Unit (MSIU) of Malta will also participate in the investigation, the AIBN added.